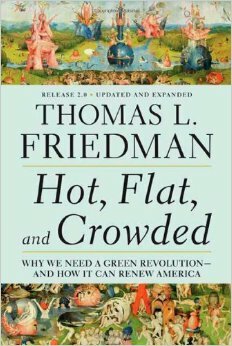 Hot, Flat, and Crowded, Thomas Friedman. Thomas Friedman is an American journalist who writes for The New York Times. He is specialized in foreign affairs, especially the Middle East, for which he has received 3 times the Pulitzer Prize on international reporting and commentary. Friedman wrote “Hot, Flat and Crowded” in 2008. In it he tackled the environmental issue. In 2005 he wrote “The World is Flat”, where he argued that technological revolution had leveled the playing field and made the world more connected, more competitive and collaborative. In this book, he claims that as we are entering the “Energy-Climate Era” the world is getting hot (global warming), flat and crowded (soaring population growth), and clear action needs to be taken to address these issues. Government need to establish a clear regulatory framework, clear price signals to establish a market in which companies can innovate to solve the problems at hand. The author included in the book dozens of references, quotes from conversations, excerpts of speeches from leading figures, and several examples. While reading it, I felt as if the author repeated himself often and that those ideas could have been conveyed in a shorter and more direct book (~480 pages in the version I have). Nevertheless, now, a few months later, going back through different marks and notes I made throughout the book I realize the great work and reference book that he put together. I would therefore recommend the reading of the book. I wanted to share below some of the notes I made along the book, grouped by theme. Harvard’s John Holdren says “A charlatan can tell a lie in one sentence that a scientist needs three paragraphs to rebut”. A good source: Pew Research Center on Climate Change report “Climate Change 101” series. On the dependency of oil, what it provokes and why it is needed to reduce it. The reliance of the West in oil is helping finance a reversal of the democratic trends around the globe. What the author calls “the First Law of Petropolitics: As the price of oil goes up, the pace of freedom goes down and as the price of oil goes down, the pace of freedom goes up”. “We are financing the US Army, Navy, Air Force and Marine Corps with our tax dollars, and we are indirectly financing with our energy purchases, al-Qaeda, Hamas, Hezbollah, and Islamic Jihad”. 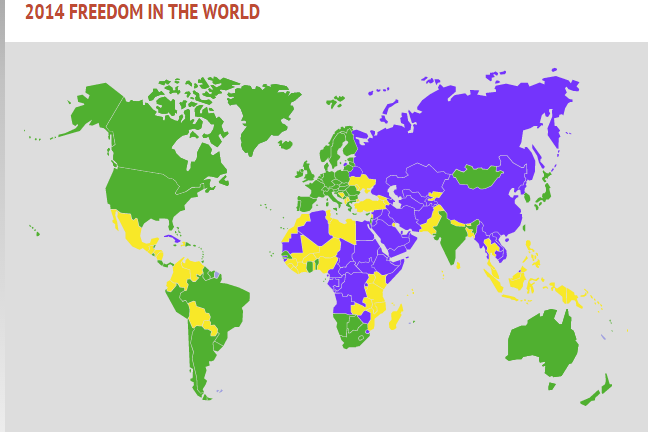 After a conversation with Moises Naim, Friedman put this idea forward in an article for Foreign Policy magazine (“First Law of Petropolitics”, May-June 2006), in which he used reports “Freedom in the World” by the Freedom House and “Economic Freedom of the World Report” by Fraser Institute, to measure freedom. “Dutch disease” refers to the process of de-industrialization that can come as a result of a natural resource windfall. The term originated in the Netherlands after the discovery of natural gas deposits in the 1960s. The influx of cash from oil make raises the nation’s goods prices making them uncompetitive to export markets and at the same time citizens buy low-cost imported manufactured goods, provoking the wiping out of the manufacturing sector. A paper studying the same topic: “Does oil hinder democracy?” (PDF, World Politics, April 2001) by political scientist Michael L. Ross from UCLA. Using a statistical analysis of 113 states between 1971 and 1997 he found evidence of what he described as “resource trap”. Saudi Arabian oil minister Yamani said to OPEC members in the 1970 “Remember, the Stone Age didn’t end because we ran out of stones.” It ended because people invented alternative tools made of bronze and then iron. On the need to take action, to foster energy technology solutions, to create strong regulations, to create a market, etc. “[…] Many bought into the idea that America could go from a technology-based, export-oriented powerhouse to a services-led, consumption-based economy – and somehow still expect to prosper”. “a series of opportunities disguised as insoluble problems”. Mother Nature, the global community, your own community, your own customers, your own neighbors, your own kids, and your own employees are going to demand that you, your company, or your country pay “the total cost of ownership” for whatever you produce or consume, including “the costs that are near-term and long-term, direct and indirect, seen and hidden, financial, social, geopolitical, and environmental”. Utilities business involves enormous sunk costs that must be recovered regardless of how much energy they sell. Utilities have vital interest in boosting electricity and gas sales to recover its fixed costs. “Price the road and clear the traffic”. If you want fewer CO2 emitters, charge people for emitting. The International Energy Agency produced in 2000 a report “Experience Curves for Energy Technology Policy” that underscored the need of price signals from the government to quickly move down along the learning curve. The lingering uncertainty about the long-term price of oil is also why some of the biggest energy companies hesitate to make big bets on green innovation. […] A strong regulation eliminates regulatory uncertainty and provides a powerful competitive incentive […] to innovate. We have been fooling ourselves with fraudulent accounting by note pricing those externalities with surcharges that reflect the true risks and costs that they entail. Introduction of the concept “green hawk”. The author realized that outgreening could be a military strategy after learning of the “green hawks” movement in the US military in 2006. It all started with Major General Zilmer’s complains to the Pentagon that he needed alternatives for the diesel fuel powering electricity generators in Iraq. A study found that 90% of the diesel used at a forward operating base were employed in generation of electricity while only 10% in mobility, and 95% of that electricity was consumed to air-condition tents. A holistic view of the situation was needed. By employing different materials that provided better isolation to the heat, the Army could save fuel and thus costs and lives of soldiers trucking fuel up and down the Iraqi roads. Thus, as the articled I linked states: “oil is a tactical liability”. An interesting note by Andrew Revkin in an article at The New York Times (September 15, 2009) “Contraception is greenest Technology”. This is linked to the “Crowded” in the title which I have barely addressed along the review, but it is worth noting that overpopulation coupled with energy usage and economic growth is a big threat to climate change. He introduced at some point the “Green Building Rating System” developed by Leadership in Energy and Environmental Design (LEED), founded Rob Watson. And a reference to this classic, the speech by 12-year-old Severn Suzuki at the 1992 Earth Summit in Rio de Janeiro.